Our parents and other family members all used to have "When I was your age..." stories to tell. It became a family joke, as I'm sure it did in most families. I vowed to never to do this to my kids. Now, I have kids, and I'm doing it!! I've become my parents! This blog celebrates that fact. This is Lola Fausta, that's me with her. Everytime one of us were born, she made the journey from the province to welcome us to the world, bearing gifts, and she always wore the dress you see here, the traditional 'baro at saya'. 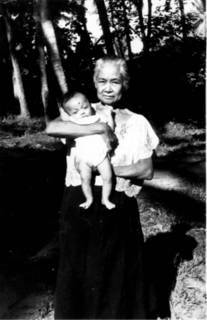 We called her Lola Pa-us, as we Filipinos have a penchant for pronouncing the letter f as p. She lived in a very small town in Aringay, La Union, by the sea. She is actually my dad's aunt, but she was more like a mother to him. She was the one who raised him after his mother died when he was only 3 years old. We used to go visit Lola Paus on holidays, and once in a while our parents would even leave us with her for a few days, maybe even a week. She would always treat us like visiting princesses, always buying and preparing our favorite foods. For me, that meant seafood. Anything from the sea, and it wasn't hard to come by, where she lived. Fresh fish from the sea always went by her house first before going to the market. You see, she lived along the only road that connected the fishing villages to town, so all the fishermen's wives would have to go by her house to go and sell their catch of the day in town. When they know her grandchildren are around, then they make an intentional stop as they know she will be stocking up. They would stop by with whatever it is they netted that morning, from seaweed (ar-arusep), fish, shrimp, and my all time favorite, crabs. She would always tell them to save crabs for her. She lived in an old Spanish style house with corner posts that were so thick I could hardly put my arms around them as a child. The windows were 'capiz' made from scallop shells, and as was the custom in places prone to flooding, the main floor was at least 6 feet above ground. A grown person can walk under the house upright. The main room was enormous, with two smaller bedrooms towards the back. It used to have huge double doors that led to the main staircase in front of the house, but by the time we started visiting her, the main staircase had rotted away, so we always entered via a small staircase in the back of the house. The double doors in front remained though, and were opened on occation to let the breeze in. She had what seemed like massive rocking chairs too, and they were most often positioned in front of the doors to capitalize on the cool breeze. Sister O fell out of the front door taking one of the rocking chairs with her, at one time, but that's another story :) They say that during the Japanese ocupation, her house was used as the Japanese headquarters because it was the only one in the little town big enough. As a result of it's somewhat infamous past, it was always rumored that the house was haunted by all the victims of the atrocities committed by the Japanese. But, I am getting away from my title, of why my lola was gourmet. That too, will be another story. I am amused when I look at the cooking shows and see how many people now use salt dishes, and finger bowls. My lola used these at every meal. She used local sea salt, "sel de mer", because it was cheaper than Morton's. I don't even know that they had Morton's back then, but try buying sea salt now, they're $8/pound! She didn't have salt shakers, but rather had salt dishes on the table. The dishes, all Japanese porcelain that were left behind. She also had finger bowls, bowls with water in them for rinsing your hand while you are eating as it was the custom to eat with your hands, especially when eating seafood. Lola Faus was a great cook. If she wasn't, I wouldn't know because she was one of those people whose cooking you just remembered. All these recipes nowadays that are wrapped in corn husk, banana leave, grape leaves, etc? She used to do those too. She wrapped small fish in banana leaves and cook them plainly in just salt and vinegar, and they would come out sooo good! She is best remembered though, for her suman, rice cake wrapped in banana-leaf. It was a given that every Christmas, we would receive some of Lola's suman, and she would travel to Baguio to bring us our pasalubong; no easy feat as she had to travel by bus and carry her bags, 'bayon', with her. She was just that way though, a very giving person. If you were the one to visit her, she would still give you something to take home. If you visit unexpectedly and she didn't have suman ready for you to take home, she will find something, anything, just so you wouldn't go home empty handed. We have been known to carry home with us, live chickens, fresh uncooked chicken eggs, a whole side of bananas, cavans of rice, fresh oysters, or dozens of coconuts. No matter what though, no one leaves her house empty handed, no matter who you were. I'll never forget her smell...that old fashioned flower perfume mixed in with camphor and moth balls. On her, it smelled so sweet to me. Remember? Yo mama! I like wat u posted. Just got a chance to read it. I was being naughty today. My team at school is watching movies today and I forgot my permission slip so I'm doing my Power Point for Language Arts. good for you pasibe sisters you got this kind of file regarding your family tree. at least you are aware of it. my eldest did a documnetary on the life of my lola teresa and that was the highlight of the celebration last january 1 its my lola's birthday and i just watched the VCD tape yesterday it was so touching I cried talaga nga sangit no amount of words can really compensate my thanks and gratitude to our olds they have done a lot. that is why now that there is still a time let your old folks feel that you care for them.